Take a stroll with a Jedi Master! Canvas art print inspired by the Star Wars film The Empire Strikes Back. Limited edition of only 25 hand-numbered pieces, each signed by the artist! Measures 20-inches tall x 16-inches wide. How about a nice morning stroll with the Jedi Master of all Jedi Masters? This magical artwork inspired by theStar Wars film The Empire Strikes Back features Master Yoda on Dagobah. 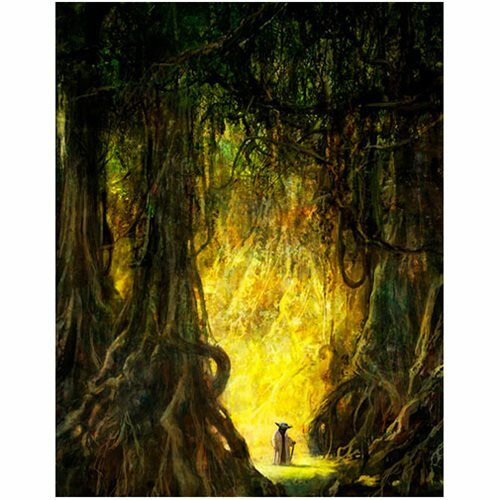 Measuring 20-inches tall x 16-inches wide, the unframed Star Wars Morning Stroll by Cliff Cramp Canvas Giclee Art Print is a limited edition of only 25 hand-numbered pieces, each signed by artist Cliff Cramp, and each with a certificate of authenticity! Make it yours, you will.